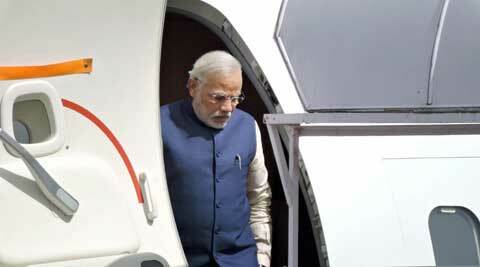 This is Prime Minister's first visit outside Delhi after taking over on May 26. Prime Minister Narendra Modi on Saturday dedicated India’s largest warship INS Vikramaditya to the nation and pitched for making the country self-reliant in manufacturing defence equipment, shedding dependence on imports. In his first outing after taking charge as Prime Minister, he addressed the naval personnel onboard the ship off the Goa coast, calling the addition of the warship to the force as a “historic” step. “It is an important day for our nation. It is a golden day in Indian Navy’s history. For me, it is a matter of pride and happiness that INS Vikramaditya is joining the Navy. It is a historic step,” he said. The Prime Minister also promised to set up a War Memorial for those who sacrificed their lives for the country. “Our government has the potential to match anyone in the world and the reason for this is the capability of our soldiers who give us the strength to do so,” he said in his address, adding that the country intends to move forward in the same manner, without lowering its eyes. He also called for setting up a Naval NCC network across the country that could prepare a dedicated force of soldiers which could help the Navy emerge as a big force in the coming times. Arriving on board the warship in a Sea King chopper, the Prime Minister was given the ceremonial guard of honour by the Navy and was briefed about the warship. He also sat in a MIG 29 aircraft and had a feel of the combat fighter on the ship. The Prime Minister spent a few hours on board the 44,500-tonne warship, his first visit to any defence facility. The prime minister was accompanied by Minister of State for Defence Rao Inderjit Singh, National Security Adviser Ajit Doval, Defence Secretary R K Mathur and Naval Chief Admiral Robin Dhowan. During his stay on the ship, acquired from Russia for over Rs 15,000 crore, Modi witnessed ‘air power demonstration’ by various naval aircraft, including MiG 29K, Sea Harriers, P 8I Long Range Maritime Patrol Anti-Submarine Warfare aircraft, TU 142M and IL-38SD maritime surveillance planes along with Kamov and Sea King helicopters. He also witnessed high-speed manoeuvres by the Navy’s Western Fleet ships including aircraft carrier INS Viraat, Delhi-class destroyers and Talwar-class frigates. The air demonstrations were, however, hampered by heavy rain. Modi interacted with the senior officers and the crew. The deal for the aircraft carrier was signed during the previous NDA regime in 2004 and the ship will be dedicated to the nation after a gap of ten years. The vessel had joined the Indian Navy on November 16, 2013. The ship was earlier commissioned by the then defence minister A K Antony in Russia. With her complete stock of provisions, she is capable of sustaining herself at sea for about 45 days. It is a modified Kiev-class aircraft carrier which was purchased by India from Russia for the Indian Navy in 2013. The ship has been renamed in honour of Vikramaditya, a legendary 1st century BC emperor. Originally built as Baku and commissioned in 1987, the carrier served with the Soviet (until the dissolution of the Soviet Union) and Russian Navies before being decommissioned in 1996 as it was too expensive to operate.